The front of the Barclays Center in Brooklyn. Nominal ownership by New York state enables tax breaks for the Russian Billionaire. This, however, is false: Ratner did not own the arena and he did not sell it to Prokhorov. The claim that the arena is privately owned matters because it obscures the difference between the arena and a related entity – the arena operating company – and conceals how public policies were designed to save wealthy businessmen Ratner and now Prokhorov tens of millions of dollars. 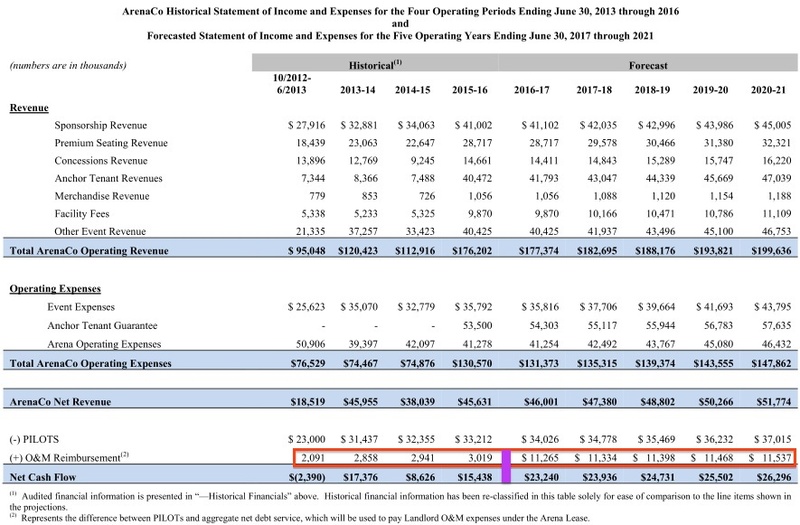 Ratner and now Prokhorov do have ultimate responsibility for the Barclays Center bottom line, hoping that revenues (including the naming rights sold to Barclays) offset expenses and pay off construction financing, leaving profits. But their private companies have never owned the arena: They’ve owned the arena’s operating company. Empire State Development, New York state's economic development authority, owns the arena premises and leases it to a special-purpose entity, the Brooklyn Arena Local Development Corporation. 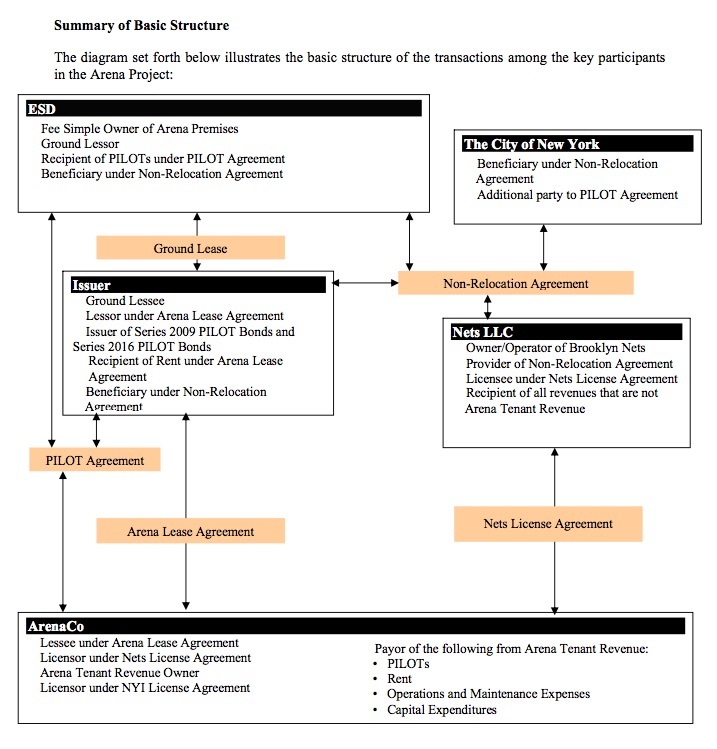 BALDC, called the “Issuer” in this chart (from a 2016 bond document), has an arena lease agreement with ArenaCo (aka Brooklyn Events Center), a subsidiary of another company, which is today owned by Prokhorov. Why the Rube Goldberg structure? It unlocks two benefits typically unavailable to owners of private property: avoidance of property taxes, and access to tax-exempt financing. Such backdoor corporate welfare is common among New York City professional sports facilities. Yankee Stadium and Citi Field were built on public property to enable such benefits. Madison Square Garden managed to finagle a property tax exemption under the questionable premise that the Knicks and Rangers might otherwise be tempted to leave the nation’s largest market. In Brooklyn, if the Barclays Center were privately owned, it would’ve paid some $41 million in property taxes in 2014, according to a letter from the arena operator. Instead, the operator – now Prokhorov's firm – makes payments in lieu of taxes, or PILOTs, that cannot exceed what taxes would be. Those PILOTs – nearly $35 million this year – do not go to city coffers, but instead pay off construction debt and bolster maintenance funds. Tax-exempt construction debt is far more attractive to buyers than taxable debt; the avoidance of taxes means buyers accept a lower interest rate. 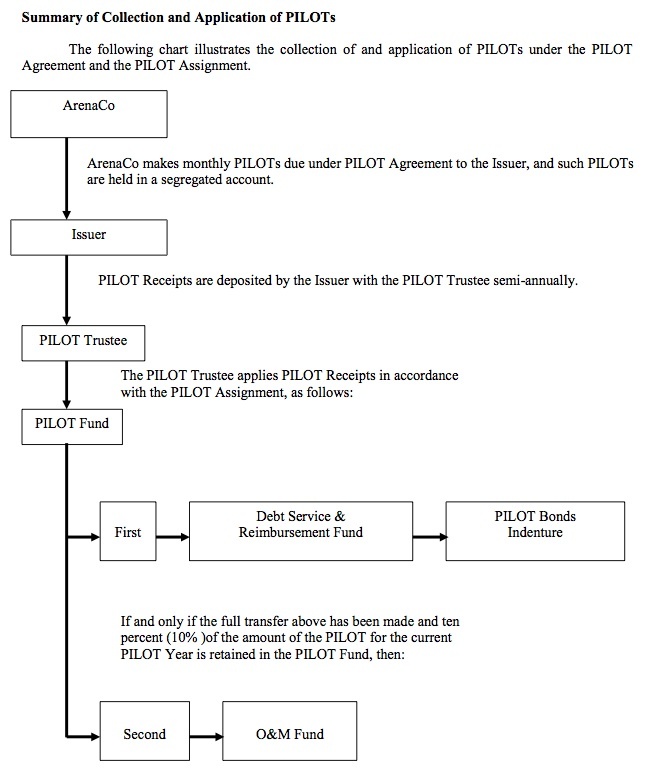 Presaging bond issuance in 2009, New York City's Independent Budget Office estimated that Ratner would, over the term of the bonds, save $193.5 million thanks to such financing; after a smaller amount of bonds were issued, the Brookings Institution later estimated a $161 million revenue loss. No one has recalculated those numbers, but Prokhorov has an even better deal now. In 2016, BALDC refinanced the debt at a lower interest rate, which Bloomberg estimated would ultimately save Prokhorov $90 million, compared to the earlier round of financing. The public assistance would be harder to obtain if the Brooklyn arena were truly privately owned. It may seem like a mouthful to specify that Prokhorov owns the arena operating company, while the Barclays Center itself is owned by the state. But referring to it accurately is essential. Otherwise, we forget how the ownership structure enables taxpayer help for a Russian oligarch. is a Brooklyn journalist who writes the daily blog Atlantic Yards/Pacific Park Report and is working on a book about the project.